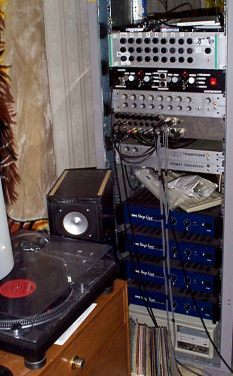 The synth stack consists of the following modules, a combination of Oakley Sound pcbs mounted on 19" panels and home-made custom units in 19" rack mounted boxes. * Passive attenuator and input panel for A&D Ambisonic Pan-Rotate unit, B-format switch for pre and post record monitoring. * Ye Olde 120MHz AMD P5 PC containing a Terratec EWS64XL card to be a sampling synth when I can be bothered with it. * Technics SL1210 Turntable for those SQ SOB moments. Inter-head delays are 85mS, 87mS, 93mS and 32mS. * Unit with >60 second period LFSR pseudo-random white noise generator, amoungst other redundant bits. * To the left, white envelope holding laser printed transparencies of instrument waveforms for placing over the oscilloscope screen and then tuning the waveform generator to. * Utility shelf with PSU for Matrix Switcher and extra short range FM radio transmitter, and old bits of cage nuts, screwdrivers and cable ties.